Lou Reed – Lou Reed – But Is It Any Good? OTHER SONGS YOU MAY KNOW: Wild Child is probably the best known. WHAT’S IT ALL ABOUT: Velvet Underground leader’s first solo album is mostly leftover tracks from that group, but the production choices mar the songs at times. 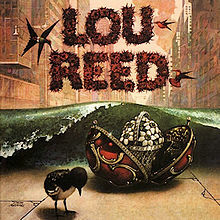 SOME WORDS, PHRASES AND CLAUSES ABOUT THIS RECORD: The first Lou Reed solo album was anticipated by some, as the Velvet Underground was getting some critical acclaim (finally) in 1971 or so. While the record has some moments (“Wild Child”,”Ocean”, “Ride into the Sun”) overall it seems lackluster. The first side of the album, especially, suffers from the addition of backing vocals that are more out there than what the songs called for. Maybe I’m used to the VU versions of “I Can’t Stand It” or “Lisa Says”, but the backing vocals and arrangements seem a bit intrusive to the songs. Eight of the ten tracks were Velvet Underground outtakes or songs that never were recorded by played live. The songs are good, I just think they could have been arranged better. NOTES & MINUTIAE: The two ‘new’ tracks (not VU leftovers) were “Going Down” and “Berlin”. The latter would be re-recorded as part of the Berlin album the next year. GRADE: B: Side two is much better, and “Wild Child” and “Ocean” are the saviors of the album.